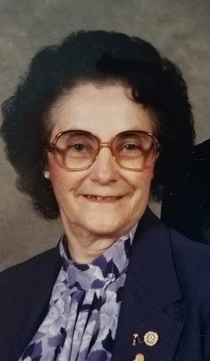 Obituary for Nola (Cornia) Jackson | Crandall Funeral Home Inc.
Nola Cornia Jackson was reunited with her loving husband of 75 years, her parents and six siblings on Sunday, November 4, 2018 in Hyrum, Utah. Nola was born September 19, 1920 to Edward and Margaret Eve Cameron Cornia at her family home in Woodruff, Utah. She was a surprise to her parents and the youngest of seven children who had already left the family home by the time she was born except for one brother. Nola attended Woodruff Elementary School from 1st grade to eighth grade then spent the next few years in Ogden and Idaho Falls helping her sisters. She returned home for her senior year at South Rich High School where she graduated in May 1939. After graduating Nola moved to Blackfoot, ID to work at her sister’s clothes shop and take care of her sister’s children. Later she moved to Ogden, and worked at the Union Pacific Laundry. While working in Blackfoot and Ogden she took up a long distance courtship with her future eternal companion Ross Jackson. After only going on four in person dates, Ross wrote and asked her to marry him. Ross was in the Army Air Corp training for deployment to England. Nola made her first trip on a train to Houston, TX to be married. They were married on March 20, 1943 in Houston, by the mission president. Their marriage was later solemnized in the Salt Lake Temple and they recently celebrated 75 years together. After Ross was released from service during WW II they moved back to the ranch in Randolph and then to Logan, UT where Ross completed his schooling. They then moved to New Mexico for several years where Ross worked with the Native Americans and then returned to the ranch in Randolph where Nola and Ross raised their family and happily spent the rest of their years. During her life Nola served in many church callings for the Church of Jesus Christ of Latter-day Saints including working in the Logan Temple which was a lifetime dream of hers. Her greatest love was her family who she loved to serve, along with friends and others in need. Nola loved to sew, crochet, and play the board game Aggravation and card games with anyone who would play with her. During her life she crocheted afghans for all her children, grandchildren, great grandchildren, and great great grandchildren. She crocheted hats and loved to give them away to anyone who come to visit, and donated hundreds of crocheted stocking hats for those in need. Ross and Nola’s posterity include six children; Jeralene (Reed) Groll, Judy (Kent) Stuart, Nancy (Rauhn) Panting, David (Cindy) Jackson, Bill (Kelli) Jackson and Robert (Jerilin) Jackon. She has 34 grandchildren, 73 great grandchildren, and 8 great-great grandchildren who she loved dearly and will miss her. Funeral services will be held on Thursday, November 8, 2018 at 11:30 am at the Randolph, Utah Church of Jesus Christ of Latter-day Saints building. A viewing will be held Wednesday evening at the Church from 6 to 8 pm as well as Thursday morning from 10 to 11:15 am prior to the service. Interment will follow at the Randolph Cemetery.